A Director and Producer of award-winning independent film, live event and commercial media productions, over the past decade Schroder has produced more than 100 film and television productions reaching more than 90 million viewers worldwide (from commercials and music videos to events and independent short and feature films). Schroder has worked in various capacities on more than 250 productions, ranging from independents to film and television productions for most major studios and US television networks. 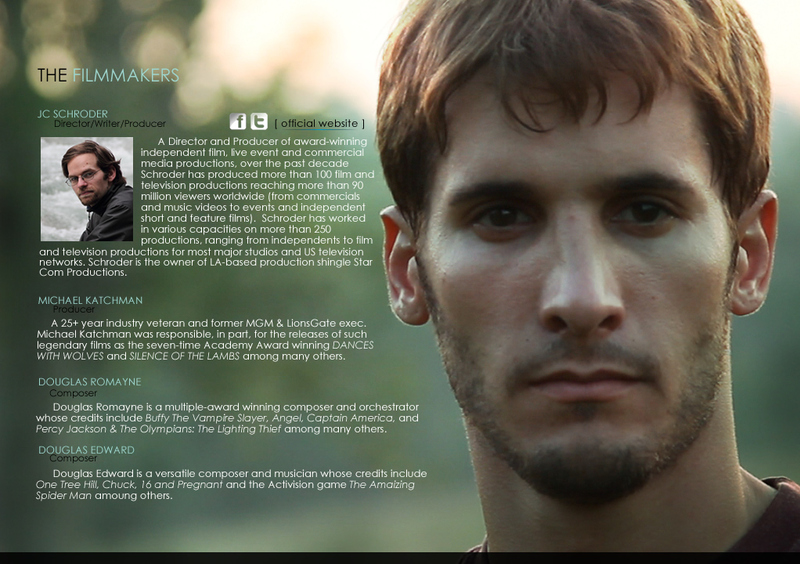 Schroder is the owner of LA-based production shingle Star Com Productions. A 25+ year industry veteran and former MGM, LionsGate, and Orion exec. Michael Katchman was responsible, in part, for the releases of such legendary films as the seven-time Academy Award winning DANCES WITH WOLVES and SILENCE OF THE LAMBS among many others. Douglas Romayne is a multiple-award winning composer and orchestrator whose credits include Buffy The Vampire Slayer, Angel, Captain America, and Percy Jackson & The Olympians: The Lighting Thief among many others. Douglas Edward is a versatile composer and musician whose credits include One Tree Hill, Chuck, 16 and Pregnant and the Activision game The Amaizing Spider Man among others.